Brisbane couple Brigitte and Will were working in the same shopping centre when they caught one another’s attention across the foodcourt. When Brigitte told her best friend she thought he was cute, she cheekily slipped him Brigitte’s number! Obviously this was a ballsy, yet fateful move, as the pair were married in a gorgeous Noosa River wedding four years later. When planning their wedding, Brigitte’s first priority was getting the perfect dress, and she had her eye on one particular dress by Australian designer, Anna Campbell. After flying to Melbourne to get her hands on the coveted designer’s gown, all the other wedding planning fell into place. Scouring Pinterest, The Bride’s Tree (of course!) and paying close attention to the portfolios of her chosen Sunshine Coast wedding suppliers, Brigitte was swift to lock in her favourites for her October wedding in Noosa. The official part of the day kicked off with a ceremony at Maison La Plage, one of Noosa’s most popular outdoor wedding ceremony locations. This space makes perfect sense when natural finish wooden decor is used to blend in with the superb natural surroundings. Knowing this,Cloud Nine Weddings brought their experience to the occasion with their styling, and providing a drinks station for the comfort of the couple’s 53 guests. The natural wooden ceremony arbour was accented with a pretty pastel floral arrangement by Magnolia Grove Flowers. 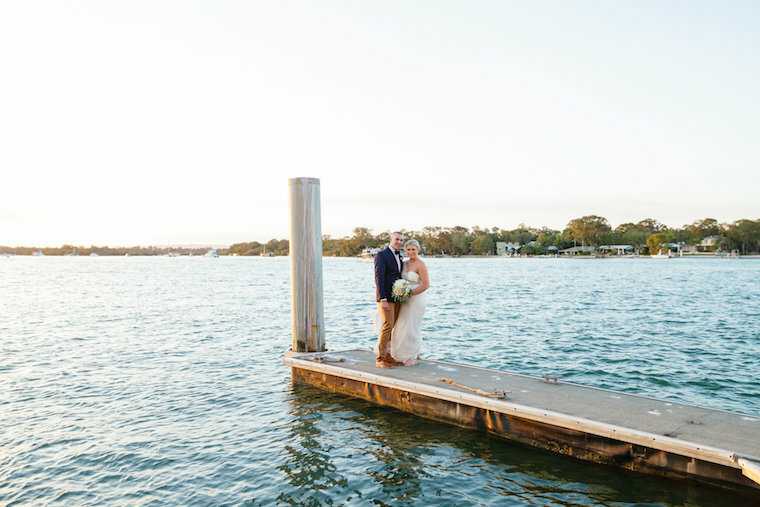 The day flew by in a whirlwind, so the moment the newlyweds sat down to devour their delicious meals at their Noosa River reception venue, Noosa Boathouse, was a big highlight as it was time to finally relax and enjoy the moment, and finally being married! DIY: We made our own wedding favours – a lucky bamboo in a milk bottle. Honeymoon: Due to the stage of Will’s career and my university schedule, we have postponed our honeymoon until next year. We did have a few days at Noosa after the wedding though.